Inspired by her travels to Byzantine churches in northern Greece, this series is a non-religious tribute to the nature and civilisation of the region. Layers of red and green crosses spilled over each other, like the sun's rays splashed over the tops of forest trees during a sunset. Like in a circus, contrasting colours are layered over each other, creating a busy, clashing effect. Diptych: 90cm x 30cm each. Layers of gold and brown painted on top of each other, giving a metallic shine and depth to both autumn and the painting. Layers of purple hues painted over each other in heavy acrylic, giving the painting a mesmerising depth. The piece is inspired by a combination of Greek Byzantine churches in the north of the country and the effect hallucinatory drugs had on Delphi oracles in the south. Complementary colours layered over each other in heavy acrylic, giving the painting a 3D effect. 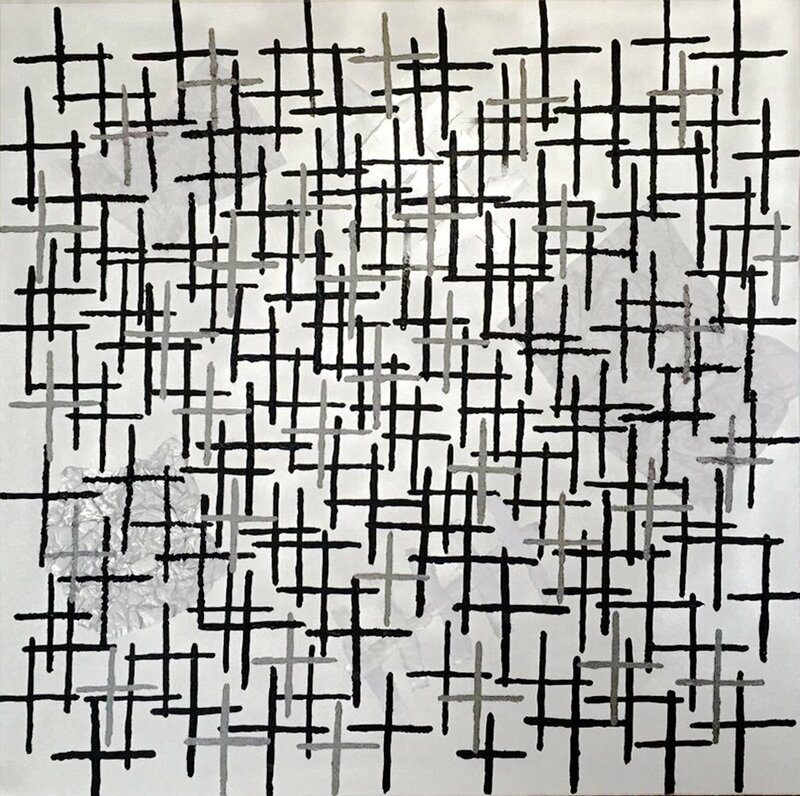 Tissue paper resembling patches and stitches of a relationship, covered in black and grey crosses. Acrylic and tissue paper on canvas. Layer upon layer of blue hues, creating a 3D deep blue effect.